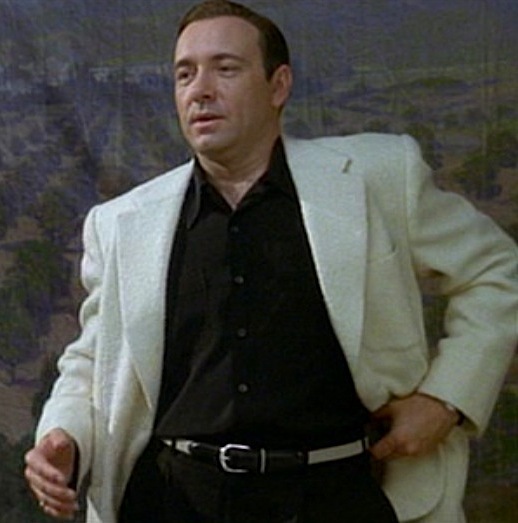 Kevin Spacey as Sgt. Jack Vincennes in L.A. Confidential (1997). After binge-watching three seasons of House of Cards, it’s refreshing to revisit the days when Kevin Spacey was far less murderously calculating. Sure, he was also a psychopathic serial killer in Se7en and a diabolical master criminal in The Usual Suspects, but his charming turn as the laidback and endearingly morally bankrupt LAPD Sergeant Jack Vincennes is a fine reminder that Spacey is good at being the guy you want to root for. “Hollywood Jack” has the most distinctive wardrobe of any of the LAPD cops in L.A. Detective. Even on the job, he stays fashionable in atomic fleck sport coats and silk suits. Vincennes always shows up to the party – like the Badge of Honor Christmas party – with a unique sport coat to help him look like even more of a celebrity than the cinema set he pals around with. The city councilman’s re-election party with the Badge of Honor cast is no exception, with Vincennes wearing an outfit comprised solely of black and white… an interesting combination for a man whose morality is anything but. For the party, Vincennes wears a luxurious lambswool sport coat just one shade closer to being cream than white. The lambswool is likely blended with cashmere or another soft material, thus making Vincennes look even more distinctive and debonair to any potential ingenues hanging around the Badge of Honor set. The single-breasted jacket has a fashionably large cut with padded shoulders, roped sleeveheads, ventless rear, and a full chest. The notch lapels are wide with surprisingly short gorges. Danny DeVito must have rejoiced that most of his screen time was shared with the 5’10” Kevin Spacey rather than the 6′-tall Russell Crowe. Two inches taller and his co-star would’ve been off the screen! Each of the three external pockets of the jacket are patches with rounded bottoms: one on the left breast and two larger pockets on the hips. The two buttons on the front and two buttons on each cuff are covered in the same material as the rest of the coat. You’d be hard pressed to find many characters cooler than Hollywood Jack. Jack wears a black silk sports shirt with a large camp collar, worn open. Though uncommon for this type of shirt, Vincennes’ shirt has double cuffs that he fastens with a pair of plain gold links. Vincennes’ black pleated trousers have a medium rise, considerably low for the era, with belt loops, side pockets, and plain-hemmed bottoms. The two-tone belt is black leather with a white center around the sides and a curved steel single-claw buckle. His black snap-closed leather holster – for his Colt Commander semi-automatic pistol – is worn far back on the right side of his belt for a strong-side draw with his right hand. Jack also wears a pair of black and cream two-tone leather spectator Oxfords, his casual footwear of choice. Two-tone spectator shoes often vary by what part is what color. 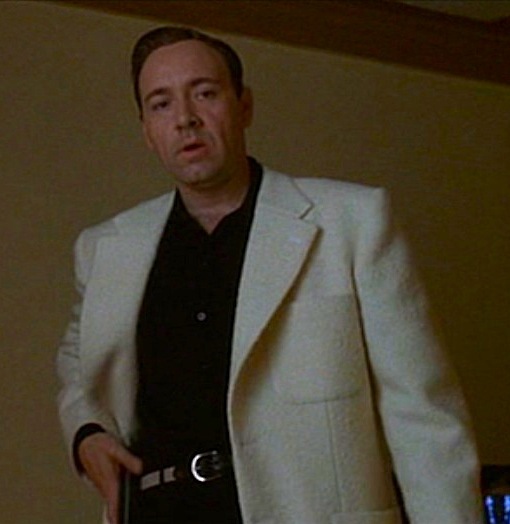 Although we’re only offered the briefest of glimpses as Jack exits his car outside the Hollywood Center Motel, we can see that Jack’s perforated toe cap, eyelet tab, and outside counter are all black leather with a white leather vamp and quarter. The laces are black to avoid a contrast on the eyelet tab. You can find a similar pair, in black and white, on Amazon. 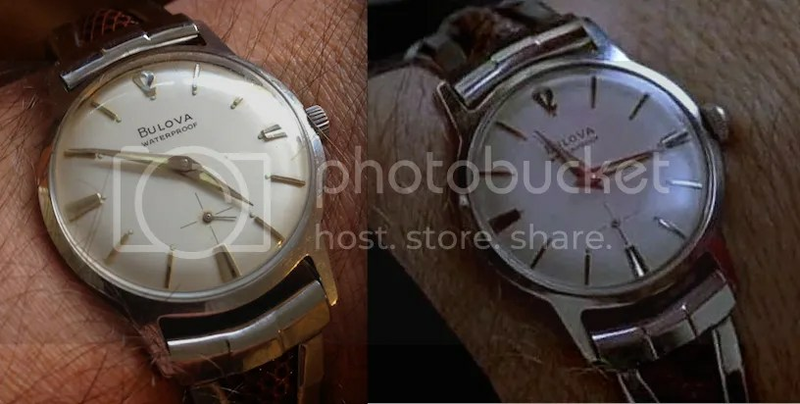 Vincennes’ Bulova has a stainless case and lugs connecting it to a brown “lizard expansion band”. The only numeral on the clean-looking white dial is a very dec-looking “12” at the top. Jack’s only other accessory is the usual gold ring on his right pinky. The black square face of the ring has a pinhead-sized diamond in the center. This short sequence tracking Jack across town from a crowded party to a dark-lit bar and finally a lonely dive motel is backed by some fine era-appropriate music. Gerry Mulligan’s quartet, featuring talented trumpeter Chet Baker, provides the music for the city councilman’s re-election party with “Makin’ Whoopee” and “The Lady is a Tramp”. Everything about this music selection is perfect for the scene, especially when one knows that the real Gerry Mulligan, a heroin addict like Baker and many of their peers, was just months away from getting pinched for narcotics and spending six months. Mulligan and Baker first started playing together at The Haig on Wilshire Boulevard while Mulligan was arranging for Stan Kenton. Their jam sessions led to an experimental and wildly successful pianoless quartet that also included drummer Chico Hamilton and bassist Bob Whitlock (…although it is Larry Bunker and Carson Smith, respectively, heard on “Makin’ Whoopee”). The improvisations from Mulligan on sax and Baker on trumpet are a special highlight with the two musicians improvising and complementing each other with a nearly telepathic sense of the other man’s musical direction. After his arrest, Mulligan spent the last few months of 1953 imprisoned while Baker became a star. The two would record and perform together again over the following decades, but it is the 1952-1953 quartet sessions that are most legendary. After setting up Matt Reynolds at the party, Vincennes heads to the iconic Frolic Room bar on Hollywood Boulevard between Argyle and Vine where he attempts to wash away his self-disgust with a so-far unidentified whiskey. The familiar image of a noir-esque antihero cynically drinking alone in a darkened L.A. bar. From the bar’s now-famous jukebox, Dean Martin provides some dark juxtaposition with his pleasant 1949 ditty “Powder Your Face with Sunshine (Smile, Smile, Smile)”. Jack doesn’t follow Dean’s advice, but he certainly powders his bartender’s face with a smile when he leaves a $50 bill on his glass. No good deed goes unpunished, though, and by the time Jack gets to the Hollywood Center Motel, it’s too late. He discovers Matt Reynolds’ corpse with his throat freshly slashed. In the background, Joni James croons “How Important Can It Be?”, recorded in 1955 for MGM. The song eventually reached #2 in the charts, another dark juxtaposition as the corpse on the floor failed to reach any heights of stardom as he had hoped. Jack Vincennes knows how to look stylish for a hip L.A. party. Elements of the outfit are very 1953, but the essence remains a fashionable look more than sixty years later. No stodgy Buicks or run-of-the-mill Fords for this cop, Jack Vincennes scoots around L.A. in a two-tone 1953 Studebaker Commander Starlight Coupe, a futuristic-looking symbol of that space-obsessed decade. This coupe would also influence the redesign of Rootes Group’s Hillman Minx automobiles in the late 1950s and early-to-mid 1960s, all designed by Raymond Loewy Associates. The “Commander” name was used by Studebaker for various cars from 1927 through 1964, but it’s the post-WWII design that captured the most attention. In 1947, Raymond Loewy designed the unique 2-door Starlight five-passenger coupe for Studebaker that became an instant hit on the market. The sheet metal on the front was redesigned to include the iconic “bullet nose” for 1950, ushering in the space age decade with a futuristic look that would’ve blown H.G. Wells’ mind. An automotive designer from Loewy’s studio, Robert E. Bourke, redesigned all Studebakers for 1953, now offering both Starliner hardtop coupes and Starlight five-window pillared coupes for the Commander and Champion model ranges. 1953 was also the first year that no convertible version was offered; evidently the car was cool enough to not need an open top. The Starlight and Starliner names only lasted two model years; Studebaker took on more literal nomenclatures for its coupes in 1955 as the Starlight became the “5-passenger coupe” and the Starliner became the “5-passenger hardtop”. The next year, the pillared ex-Starlight coupes were rebranded as the Studebaker Hawk. 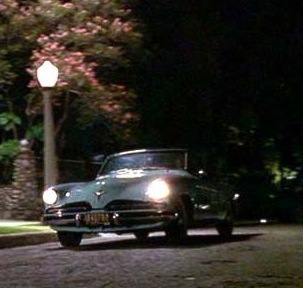 The particular ’53 Studebaker driven by Jack Vincennes in L.A. Confidential is painted Chippewa green with a darker Lombard green roof. Most specs for this model were found at Classic Car Database. Matt Reynolds: When l came out to L.A. this isn’t exactly where l saw myself ending up. Jack Vincennes: Yeah, well…get in line. One day I’ve got to let this thing wind down so I can get a good pic with his and mine set to the same time. Actually wear this thing a good bit more than I initially thought I would. Very light and comfortable, and gets a lot of compliments. I never run into anyone with one like it, that’s for sure.